Q: What vaccinations must our dog have ? A: Your dog must be annually injected again Distemper, Hepatitis, Leptospirosis and Parvovirus. We require proof by way of a vaccination card that your dog has received these injections. There is also a vaccination available for protection against “kennel cough” however, we do not insist upon administration of this vaccination to permit boarding. If you are in doubt as to whether your pet is fully vaccinated please contact your veterinary practice for advice. We cannot accept any dog that is not fully vaccinated. Q: What is kennel cough and why do you not insist upon the vaccine? Kennel cough is a term loosely used to describe multiple viruses and bacterial infections which cause upper respiratory infection. It is a form of bronchitis and is similar to a chest cold in humans. Although it usually clears up on it’s own kennel cough is highly contagious. For this reason some establishments will insist upon the vaccine. As there are many differing strains of infection and the majority of these are not covered by the vaccine, having discussed the benefits and disadvantages of vaccination with our veterinary advisor we have decided to leave this decision to each individual pet owner. Q: What will our dog be fed ? A: We feed the complete range of the Eukanuba premium complete dog foods, Bakers Complete, Pedigree Chum, Winalot, Chappie and Butchers. We will feed your dog as many times a day as he/she is used to. Q: Our dog will not eat any of the above or has a special diet. A: You are more than welcome to provide us with another diet for your dog which we will feed as per your instructions. Fresh meat diets need to be cooked and frozen in daily portions. Q: Our dog is receiving medication. Can they still board with you ? A: If your dog is receiving medication for a non contagious/infectious condition they can still board with us. Our experienced staff will continue to administer the medication as per your vets instructions. Q: We use homeopathic remedies. Can you continue with these ? A: Our experienced staff have good knowledge and experience with homeopathic medicines. We can continue the treatment for you, storing and handling them in the appropriate manner. However, being more time consuming and labor intensive we do make a daily charge for administering these remedies. We will also accept dogs protected with homeopathic nosodes accompanied with a veterinary certificate. Q: Our dog is very nervous and has never boarded before. A: If your dog has never boarded before, the different noises and smells may seem strange to them at first. 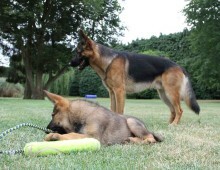 When first placed into the kennel we leave them to settle for about one hour to get used to their new environment. Then one of our experienced members of staff will visit them and start to get to know them. We try to keep one of our kennel blocks for smaller, quieter dogs and so if your dog does not quickly settle in we will attempt to move them into this quieter environment. Q: Can we bring our dogs bed ? A: We provide a suitably sized plastic bed and a fleece lining. However, we recommend that you bring your dogs own bedding as it provides a comfort zone with familiar smells. Please also feel free to bring along their favorite toys etc. Q: We have more than one dog – can they board together ? A: Each kennel can comfortably accommodate three small dogs or two medium size dogs from the same household. 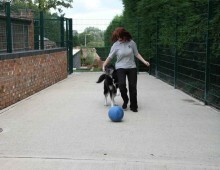 We have four extra large kennels that can comfortably accommodate up to three large dogs or two extra large dogs. Q: What happens if our dog falls ill whilst they are boarding with you ? A: Should you dog fall ill whilst in our care we will arrange veterinary care. We will contact our regular veterinary practice (Donnington Grove) unless you request that we contact your own practice. All treatment up to the value of £500 will be covered by our veterinary insurance unless it is a known condition. Your dog is covered by our insurance for up to 72 hours after leaving our care. Q: We would like to see your kennels for ourselves ? A: Kennel standards, design and premises vary greatly, and so we strongly recommend that you inspect any facilities that you are considering using. 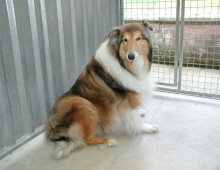 We are very proud of our kennel facilities and we will be delighted to show them to you. Viewing can be made at any time during our opening hours. No appointment is necessary.